Do you recall rosy and jim on the old tugboat and their sac magique? If you don't I apologise but they came to mind when I wanted a title for my sons nursery kit bag. Using circular needle cast on 81 stitches and join round by knitting last and first stitch together (make sure you don't have a twist now rather than finding it later). Place stitch marker to indicate round start. Knit 16 stitches, YF K2TOG, K1, YF K2TOG, K34, YF K2TOG, K1, YF K2TOG K to end of round. Knit 18 stitches and then fold work in half at this point in order to graft bottom using kitchener stitch (you can just cast off and sew up bottom if you find this easier). Cast on 2 stitches on you DPN's and make 60cm of I-cord cast off leaving a tail to stitch in the cord. Make a second length of cord as above. Thread the cords through the holes so that when you pull the ends the bag would close. Fold over the top at fold line and stitch the channel over you lengths of cord. Sew the cord ends to the bottom corners of the bag. 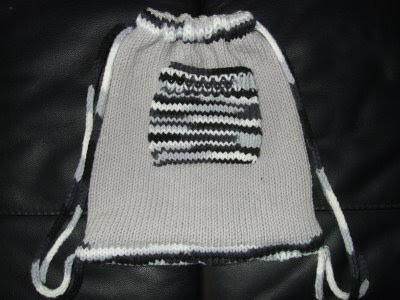 I added a grafted on pocket to use up the last of my stripy yarn. This is very cute! Thank you for sharing the pattern!